"The Yugo, exemplifying the cutting edge of Serbo-Croatian technology." -"Dragnet," starring Dan Aykroyd and Tom Hanks (yes, back then Dan had star billing over Tom). 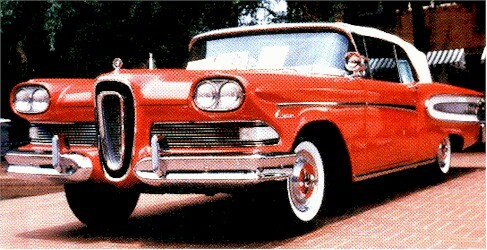 I loved the Edsel (I was a Ford man anyhow)! What was that one car from Yogoslavia (forgot name) that had the reputation as the ugliest and most trouble some car in history, and I do not mean The Thing by Volkswagon!)? The Edsel gets a bad rap. Mechanically it was a good car, it just had that unfortunate styling. But there have historically been much uglier cars since then - the '62 Dodge Dart and the much later Pontiac Aztek SUV are two such examples. "An Oldsmobile sucking a lemon." Edsel Ford, son of Henry and Clara Ford, was a graduate of the Hotchkiss School, an independent secondary school in Lakeville, Connecticut. The Hotchkiss library is the Edsel Ford Memorial Library, money for which was donated by the family. One of the displays they have right inside the library's front door has to do with the Edsel automobile (complete with a model of an Edsel). The former librarian explained that kids these days have no idea what an Edsel was, who Edsel was, or anything about him or it. The display candidly, but not unkindly, describes the anticipation Ford had for this new model and the disappointment when it did not turn out to be, let us say, the next Mustang. ...which also begs the question, whatever happened to Edsel? Edsel opened up a dealership on West Front Street in Plainfield NJ in 1957 and a coworker of mine named Lou Terminiello bought one. I wonder whatever happened to Lou? (Not to mention...whatever happened to Lou Terminiello???). The great 'toilet bowl' grill we all loved! Named after Henry Ford's son Edsel!